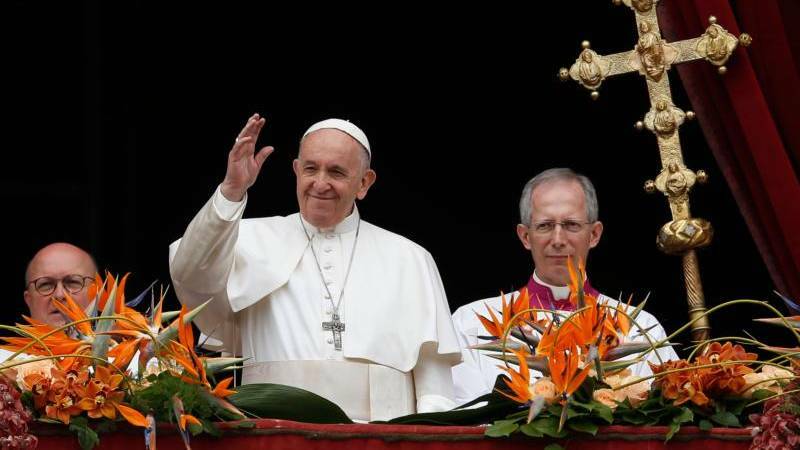 On the Solemnity of the Apostles Peter and Paul, at 9:30 am at St. Peter's Square, Pope Francis blessed the pallia (plural of pallium), taken from the Confession of the Apostle Peter and destined for Metropolitan Archbishops appointed during the past year. The pallium will then be imposed on each Metropolitan Archbishop by the Pontifical Representative in their respective Metropolitan Sees. 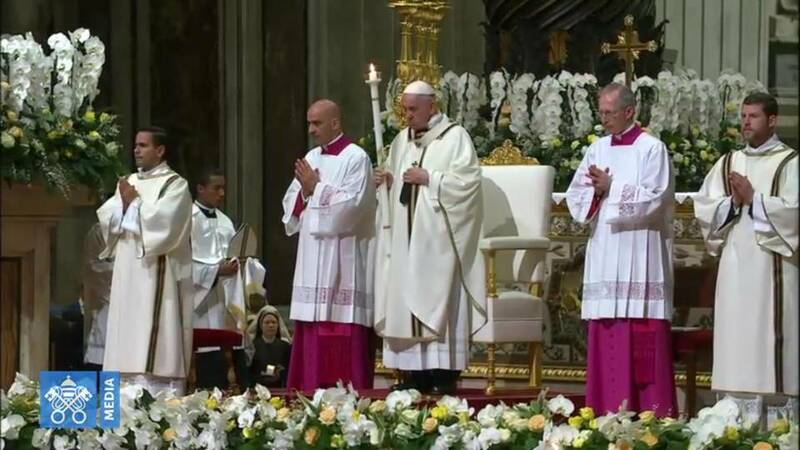 After the Pope's Blessing Rite, the Pope presided over the Eucharistic Celebration with the College of Cardinals, with Metropolitan Archbishops, Bishops and Priests. Traditionally on this feast of the Apostles Peter and Paul, Patrons of the City of Rome, there is present at this mass a delegation of the Ecumenical Patriarchate of Constantinople, sent by His Beatitude Bartholomew and led by His Eminence Job, Archbishop of Telmessos, accompanied by by Reverend Fathers Ambrosios Chorozidis and Agathanghelos Siskos. The liturgy today offers us three words essential for the life of an apostle: confession, persecution and prayer. Confession. 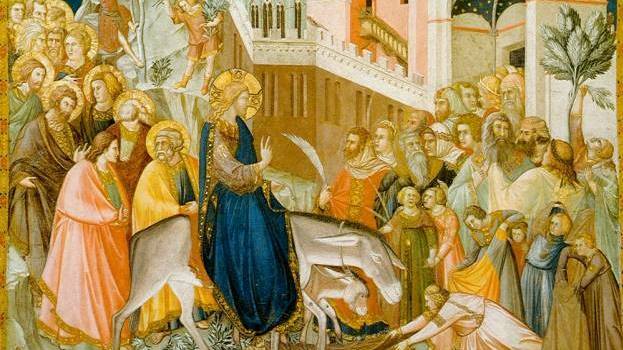 Peter makes his confession of faith in the Gospel, when the Lord’s question turns from the general to the specific. At first, Jesus asks: “Who do men say that the Son of man is?” (Mt 16:13). The results of this “survey” show that Jesus is widely considered a prophet. Then the Master puts the decisive question to his disciples: “But you, who do you say that I am?” (v. 15). At this point, Peter alone replies: “You are the Christ, the Son of the living God” (v. 16). To confess the faith means this: to acknowledge in Jesus the long-awaited Messiah, the living God, the Lord of our lives. Today Jesus puts this crucial question to us, to each of us, and particularly to those of us who are pastors. It is the decisive question. It does not allow for a non-committal answer, because it brings into play our entire life. The question of life demands a response of life. For it counts little to know the articles of faith if we do not confess Jesus as the Lord of our lives. Today he looks straight at us and asks, “Who am I for you?” As if to say: “Am I still the Lord of your life, the longing of your heart, the reason for your hope, the source of your unfailing trust?” Along with Saint Peter, we too renew today our life choice to be Jesus’ disciples and apostles. May we too pass from Jesus’ first question to his second, so as to be “his own” not merely in words, but in our actions and our very lives. Let us ask ourselves if we are parlour Christians, who love to chat about how things are going in the Church and the world, or apostles on the go, who confess Jesus with their lives because they hold him in their hearts. Those who confess Jesus know that they are not simply to offer opinions but to offer their very lives. They know that they are not to believe half-heartedly but to “be on fire” with love. They know that they cannot just “tread water” or take the easy way out, but have to risk putting out into the deep, daily renewing their self-offering. Those who confess their faith in Jesus do as Peter and Paul did: they follow him to the end – not just part of the way, but to the very end. They also follow the Lord along his way, not our own ways. His way is that of new life, of joy and resurrection; it is also the way that passes through the cross and persecution. Here, then, is the second word: persecution. Peter and Paul shed their blood for Christ, but the early community as a whole also experienced persecution, as the Book of Acts has reminded us (cf. 12:1). Today too, in various parts of the world, sometimes in silence – often a complicit silence – great numbers of Christians are marginalized, vilified, discriminated against, subjected to violence and even death, not infrequently without due intervention on the part of those who could defend their sacrosanct rights. Here I would especially emphasize something that the Apostle Paul says before, in his words, “being poured out as a libation” (2 Tim 4:6). For him, to live was Christ (cf. Phil 1:21), Christ crucified (cf. 1 Cor 2:2), who gave his life for him (cf. Gal 2:20). As a faithful disciple, Paul thus followed the Master and offered his own life too. Apart from the cross, there is no Christ, but apart from the cross, there can be no Christian either. For “Christian virtue is not only a matter of doing good, but of tolerating evil as well” (Augustine, Serm. 46,13), even as Jesus did. Tolerating evil does not have to do simply with patience and resignation; it means imitating Jesus, carrying our burden, shouldering it for his sake and that of others. It means accepting the cross, pressing on in the confident knowledge that we are not alone: the crucified and risen Lord is at our side. So, with Paul, we can say that “we are afflicted in every way, but not crushed; perplexed, but not driven to despair; persecuted, but not forsaken” (2 Cor 4:8-9). Tolerating evil means overcoming it with Jesus, and in Jesus’ own way, which is not the way of the world. This is why Paul – as we heard – considered himself a victor about to receive his crown (cf. 2 Tim 4:8). He writes: “I have fought the good fight, I have finished the race, I have kept the faith” (v. 7). The essence of his “good fight” was living for: he lived not for himself, but for Jesus and for others. He spent his life “running the race”, not holding back but giving his all. He tells us that there is only one thing that he “kept”: not his health, but his faith, his confession of Christ. Out of love, he experienced trials, humiliations and suffering, which are never to be sought but always accepted. 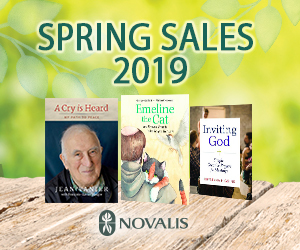 In the mystery of suffering offered up in love, in this mystery, embodied in our own day by so many of our brothers and sisters who are persecuted, impoverished and infirm, the saving power of Jesus’ cross shines forth. The third word is prayer. The life of an apostle, which flows from confession and becomes self-offering, is one of constant prayer. Prayer is the water needed to nurture hope and increase fidelity. Prayer makes us feel loved and it enables us to love in turn. It makes us press forward in moments of darkness because it brings God’s light. In the Church, it is prayer that sustains us and helps us to overcome difficulties. We see this too in the first reading: “Peter was kept in prison; but earnest prayer for him was made to God by the Church” (Acts 12:5). A Church that prays is watched over and cared for by the Lord. When we pray, we entrust our lives to him and to his loving care. Prayer is the power and strength that unite and sustain us, the remedy for the isolation and self-sufficiency that lead to spiritual death. The Spirit of life does not breathe unless we pray; without prayer, the interior prisons that hold us captive cannot be unlocked. May the blessed Apostles obtain for us a heart like theirs, wearied yet at peace, thanks to prayer. Wearied, because constantly asking, knocking and interceding, weighed down by so many people and situations needing to be handed over to the Lord; yet also at peace, because the Holy Spirit brings consolation and strength when we pray. How urgent it is for the Church to have teachers of prayer, but even more so for us to be men and women of prayer, whose entire life is prayer! The Lord answers our prayers. He is faithful to the love we have professed for him, and he stands beside us at times of trial. He accompanied the journey of the Apostles, and he will do the same for you, dear brother Cardinals, gathered here in the charity of the Apostles who confessed their faith by the shedding of their blood. He will remain close to you too, dear brother Archbishops who, in receiving the pallium, will be strengthened to spend your lives for the flock, imitating the Good Shepherd who bears you on his shoulders. May the same Lord, who longs to see his flock gathered together, also bless and protect the Delegation of the Ecumenical Patriarchate, together with my dear brother Bartholomew, who has sent them here as a sign of our apostolic communion. What is the significance of the pallium (Latin plural is “pallia”) in today’s liturgical celebration? This ancient sign, which the Bishops of Rome have worn since the fourth century, may be considered an image of the yoke of Christ, which the Bishop takes upon his shoulders. The pallium is a circle of wool that hangs around the neck and shoulders with two long pieces draping one over the chest and the other along the back. 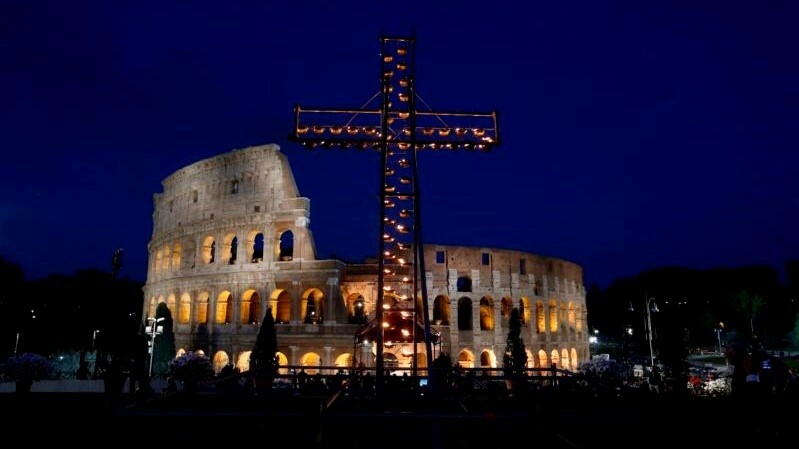 It is decorated with six black crosses and weighed with pieces of lead. The wool for the pallium comes from two lambs offered every year to the Pope on January 21, Feast of St. Agnes. They are first taken to the Church of St. Agnes to be blessed. The lambs arrive wearing floral crowns, one white and one red. These represent the purity of Agnes, which the archbishops should emulate, and the martyrdom of Agnes, which the archbishops should be prepared to follow. The lambs are then shorn and the pallia are made. On the eve of the feast of the great apostles Peter and Paul, (June 28) the pallia are stored overnight in the silver casket above Peter's tomb in the Vatican crypt. 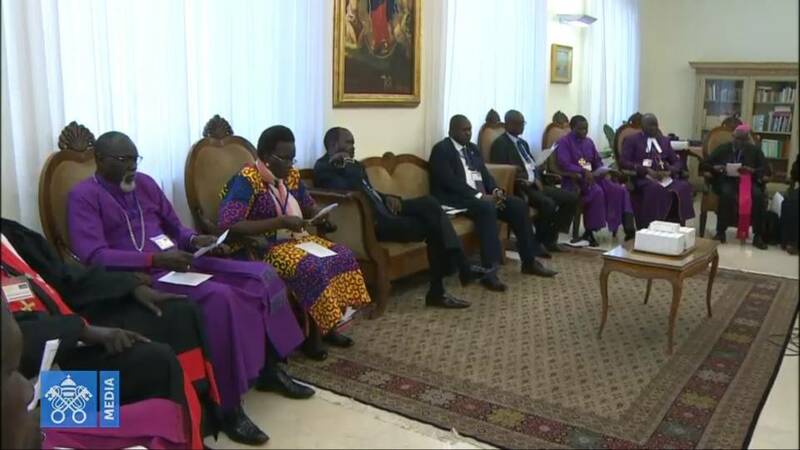 The following day (June 29) the pallia are given to the newly appointed metropolitan bishops, the only occasion in which more than one bishop can be seen wearing the pallium at the same time. Symbolically, the Pope is sharing his mission to "Feed my sheep and lambs" with the archbishops. The wool over the shoulders evokes the lamb over the shoulders of the Good Shepherd. It also reminds the archbishops of the burdens of their office. 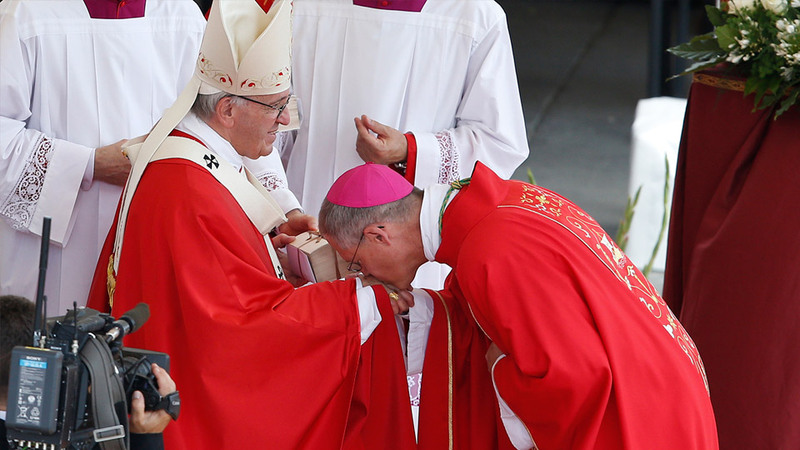 By investing each new Archbishop with the pallium, the Holy Father confers some of his own weight and responsibilities on him.